To be completely honest, I had no idea what a diving bell is before watching American Julian Schnabel’s film. Perhaps it was a pun on belle, the French for beauty. A sizable chunk of the mystery evaporated when watching, for I found out it refers to old-fashioned diving suits with the huge head gear. The French title is much more useful: Le scaphandre et le papillon. Indeed, Google Translate renders “scaphandre” as both “scuba” and “spacesuit”. 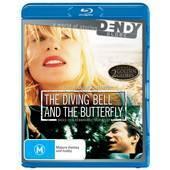 But enough pettiness about the weirdness of a phrase like “diving bell” and its use in a film title. The film, like the eponymous 1997 book upon which it is based, chronicles its own creation. Jean-Dominique Bauby was the editor of French Elle magazine but suffered a stroke that left his body paralysed but his mind intact: the so-called “locked-in syndrome”. With enthusiastic coastal hospital staff, who devise a blinking-based method of communication with his one still-functioning eye, Jean-Do (played in the Jekyll/Hyde manner necessary by Mathieu Amalric) starts grasping his reality. He re-extends his universe to meet “the mother of his children”, his friends and colleagues. Yet his relationship with his lover and his father remain more complex. In his immobile state, he realises that his imagination is infinite. He travels through beautiful places and creations and we are part of it. After realising that rewriting The Count of Monte Cristo is pointless, he instead sets on describing his condition. A movie such as this, which aims to immerse the viewer at least partly into the subject’s world, requires great technique. Jean-Do sees the world through one eye. Cinematographer Janusz Kaminski takes us there. Yet it is Bauby’s frustration, unlost humour, sexuality or love, as well as regret and pessimism which highlights his strength of character and make The Diving Bell so powerful and endearing. That the human mind is free like a butterfly in a frozen frame is uplifting, but also chilling. I personally found some of the monologues and their imagery a bit flowery. They rung disingenuous and artificially beautiful. A kind of ‘poetic for the sake of being poetic’ that may work wonderfully in prose but is hard to digest in a movie. This is personal taste: they were minor distractions and irritants. All up a wonderful, ponderous movie.